Harry was one of the first students I taught when I started coaching online. His determination as well as his options trading success has been an inspiration to our entire trading tribe. I'm honored that he took time out of his day to share his story with you...I hope you enjoy! Options Mentoring Success Story by Harry D.
I began my trading career in Jan 2008 by taking my first of several trading courses as advertised by a fairly big name trading company. It was a very expensive program, but first rate in the information and the presentation, dvd's of all live classes, notebooks and live seminars to attend. I attribute most of my learning of the basics of options to this program. I subsequently took an individual course offered by one of its instructors, again expensive. In the mean time, I was struggling to build an account with which to trade with. I had paper traded for three months and was ready or so I thought. This program and the two subsequent programs I joined all led one to believe you could be successful starting with any amount, no matter how small. I was ready believe me after spending almost an accumulated $15,000 for my Option trading education! As the result of my last course, prior to joining your coaching program, I did find a great trading partner. We have never met face to face, but we sure did a lot of trading together, working hard to make sense of the myriad of indicators everyone said we needed to trade smart. Even though we both had a strong knowledge of the basics, we found ourselves mired in layers of complexity, so much that we began to amass losing trades. We actually got to where we did not know what we were looking for! I devastated my trading account, one I had built into an account just above $4,000, some through successful trades but mostly by depositing money bit by bit from my regular corporate paycheck. I started with an amount less than $1,000. My lack of success began with the Lehman bankruptcy and it had been all down hill until I found your website Learn-Stock-Options-Trading.com. My trading partner had told me of you and I began to follow your Option Trading website in late 2009. I worked to employ what you taught and began to see success but needed more details. "You know I was following you for almost a year now and trying to piece together what you were doing...NOW it is clear, the little things I was missing, are so important..."
The year you began offering a coaching program I knew I wanted to join you and learn the details of what you felt has brought you success. I now had the chance to learn from a down to earth guy, who was honest as the day is long, who tells it like it is and sifts out the important things and points you in the right direction. I put my 'gut feeling' in check, trying to break old habits and let myself learn your way. I thank you for showing me simplicity yet with the detail you need to be successful. I have since rejoined Marketclub and have been buying an IBD paper once a week to find more stocks to put on my watchlist. Buying once a week saves me money while I am still adding little bits to the real account to build to $3,000 before I will dare think of trading with real money again. You really got that point across better than any trade school I have been a part of. Your simple honesty is so REFRESHING...and best of all...it really Works! 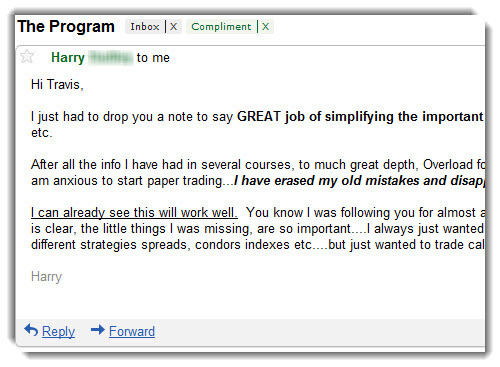 Thanks Travis...People who want to be successful trading options and don't study your website and join your coaching program simply don't know what they are missing! Here are the first two trades I did using the MC template...both winners! ***Thoughts from Trader Travis: I really appreciated Harry sending me this story. He learned what I taught, took immediate action (speed of implementation) and achieved results. He used the basic foundation of what I taught and adjusted a bit to suit his personality...perfect!!! When you join us please be sure to congratulate Harry inside the members area as it took much courage signing up for my coaching program after going through what he went through.